The new Disney Dream cruise ship returned this morning from its Christening Cruise, which launched from Port Canaveral, Fla. on Jan. 19, 2011. I had the honor of enjoying this brief 2-night cruise through the Caribbean and have brought back with me thousands of pictures, hours of video, and an endless supply of reviews and reports. It will take several days to summarize and post it all, but I thought I’d start with the most fun activity I experienced throughout the journey: the AquaDuck. 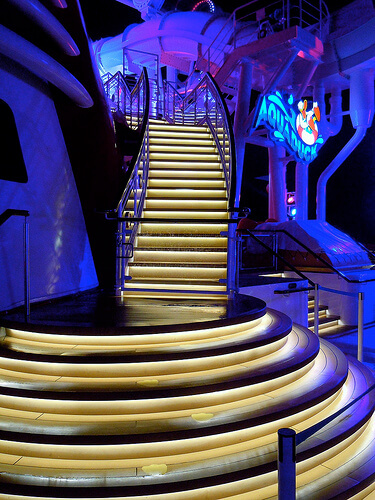 This one-of-a-kind water slide / coaster starts several flights of stairs up at one of the highest points on the Disney Dream and wraps around the ship’s edges with nothing but amazing scenic views to see. It’s thrilling and visually pleasing. During the day, the ocean views from that high up are stunning. 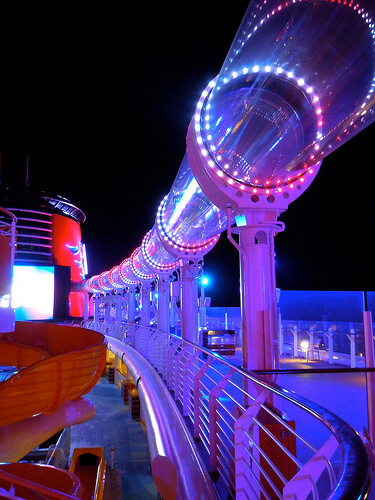 At night, the AquaDuck tube and nearby pool deck glow with electric brilliance, enhanced by reflections on the water inside the ride. 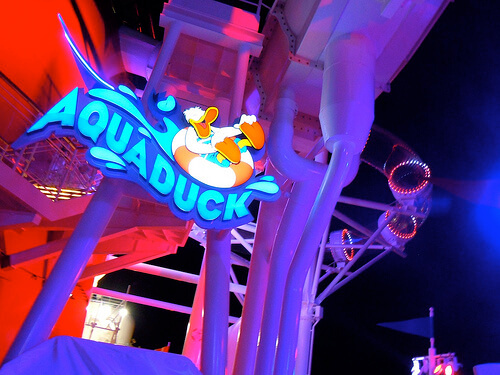 The AquaDuck should be experienced both ways. Below I bring you two POV (point-of-view) videos of myself riding the AquaDuck during the day. The first is strictly a POV shot, facing outward from the two person tube all passengers use. I was holding the camera, sitting in the front seat, with my wife Michelle behind me. Anyone who is a fan of water slides will find the AquaDuck, coupled with its panoramic views of the Caribbean, to be the single most thrilling, exciting, and captivating water ride around. It’s a must-do… several times! There will be many more Disney Dream articles, pictures, and videos, in the coming days, so keep checking back to take a look at all the decor, dining, shows, shopping, and other activities! So, Master Blaster tech on a cruise ship? Awesome. It looks really fun. Second half looks tame but I guess that’s for a breather and a view. 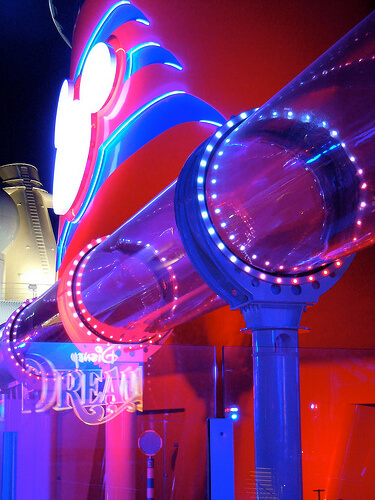 Can’t wait to see the rest of the Disney Dream coverage! The second half is definitely all about the view. The video doesn’t do it justice. Looking down on the deck on the right is fun and the panoramic view of the ocean on the left is incredible. The AquaDuck tube kind of “rocks” the raft back and forth a little during that part, so there’s some motion, but the focus is definitely the view. Thrills up front, then slow down for visuals, and end with one last corner and drop. Ricky, thank you for this video! It looks amazing! Do you know if there are weight/height restrictions on the Aqua Duck? I can’t find anything online about that except for a minimum height. But would a large man be able to ride? How about a pooh sized woman? Keep up the great work! I have only seen a minimum height as well. They do not weigh you and I didn’t see anyone get turned away. Oh my gosh, Ricky! Thank you so much for everything you have posted about everything Disney, and here lately, the Dream! Watching your AquaDuck video, had me grinning from ear to ear! Making me even more impatient til it is my turn to ride it! Thank you again for creating and continuing to give us such an awesome podcast and website to be able to come to for such great information and updates on our beloved Disney! pictures look great! does the aquaduck only operate when in port? does it operate at night? No and yes! We were definitely moving across the ocean when my POV videos were recorded. And I rode it twice at night close to midnight – a whole different experience! Awesome…I’m going on very soon but I tend to get claustrophobic, did this give a closed in feeling at all? Yes, a bit at first, but no more so than any other enclosed water slide. And once you’re out over the water, you have a feeling of freedom like no other slide. If they let you, would it be possible to ride the Aqua Duck raft from where it ends back to the start? I’m trying to figure out if I can get my H/C daughter on the ride. Unfortunately, that’s not possible. The rafts are pulled up to the top on a vertical conveyor belt of sorts. There is no way to ride it up. I’m not sure if there is any other way to get to the top aside from climbing stairs. How do you record yourself on it?